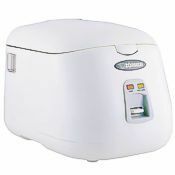 For over 40 years Zojirushi has offered a variety of rice cookers to suit individual needs. 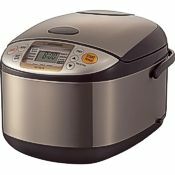 Today they offer everything from basic conventional cookers to very advanced cookers that utilize pressure cooking, induction heating and micom computerization. Learn about each line below and scroll down the page to see our rice cooker comparison charts. 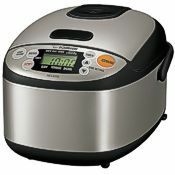 The NP-NVC Pressure rice cooker is the most-advanced Zojirushi rice cooker. The NP-NVC uses pressurized cooking, induction heating and Artificial Intelligence (AI) to cook perfect rice. Pressure cooking is a method of cooking in a sealed vessel that does not permit air or liquids to escape below a preset pressure. Cooking rice with pressure helps turn beta starch into alpha starch. This change makes the rice softer and easier to digest, and even fluffier to the taste. Rice cooked with pressure has also been found to stay soft for longer periods of time when compared to conventionally cooked rice. Zojirushi's Induction Heating (IH) rice cookers are the cutting edge in heating technology. Rather than the traditional heating element at the bottom of the rice cooker, these cookers utilize induction heating principles to heat the entire inner cooking pan, in effect making the cooking pan itself the heating element. This enables the rice cooker to make finer temperature adjustments. Because of its quicker response time, IH rice cookers can adjust the heating temperature and time quicker for better tasting rice. All IH rice cookers are also Micom rice cookers. 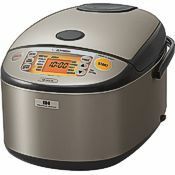 Computerized Micom rice cookers are more advanced than Conventional cookers. This line offers cookers with Fuzzy and Neuro Fuzzy® microcomputer chip technology. 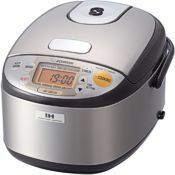 Micom or micro computerized rice cookers are easily recognizable by their digital face. 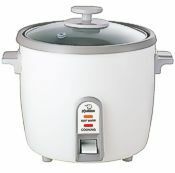 Equipped with a computer chip, the rice cooker can “think” and adjust cooking length and temperature according to the thermal sensor’s calculations. 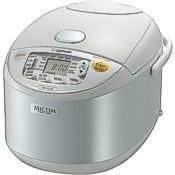 Micom rice cookers not only make perfect white rice, but also flawless brown rice, sushi rice, and porridge. 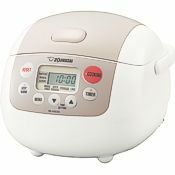 Unlike with conventional rice cookers, soaking and steaming time before and after cooking rice is automatically programmed. Fuzzy logic, originally introduced by Lotfi Zadeh in the 1960's, mimics human reasoning. 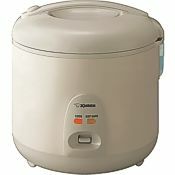 Zojirushi coined the trademark Neuro Fuzzy® to designate their advanced micro computerized rice cookers. 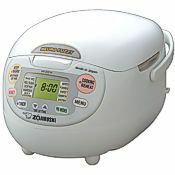 Zojirushi's Conventional electric rice cookers, first invented in 1955, are inexpensive and ideal for beginners. To cook white rice, just add rice, water, and push a button. 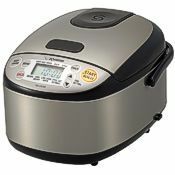 Though conventional rice cookers were designed to make perfect white rice, they also excel in making brown and sushi rice with just a few adjustments. 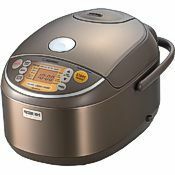 Also, because these conventional rice cookers are designed to simply heat, boil, and turn themselves off, they double as convenient steamers. 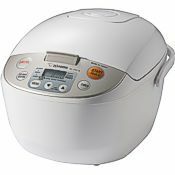 The capacity of each rice cooker is stated by how many 6-ounce cups of raw (pre-cooked) short grain white rice it will hold. Rice will double or triple in volume as it cooks. 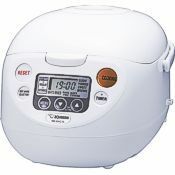 The tables below let you compare the features and key specs of our Zojirushi rice cookers, and more details are available on individual product pages. If you have questions not answered here or would just like to discuss your particular needs, our knowledgeable customer service representatives would love to talk with you. Scroll down to see all three comparison tables. The first table compares the cookers that have Pressure, Induction, AI and Micom capabilities, the second table shows Micom cookers and the third table shows Conventional cookers. 5.5 c. / 10 c. 5.5 c. / 10 c. 3 c.
10 c. 5.5 c. 3 c. 3 c. 3 c.
5 c. / 10.5 c. 5.5 c. / 10 c. 6 c. / 10 c.
Knowledgeable support from our friendly customer service staff is just a phone call or email away. See our full line of rice cookers here. We would appreciate your business and look forward to the opportunity to serve you!